The Iruin cider house, which has been making Astiazaran natural cider for more than 120 years, is one of the protagonists of “Sagardogile”, a book by Joxemi Saizar and Joseba Urretabizkaia that has been published recently and that collects 19 testimonies of cider makers of different localities of Gipuzkoa. 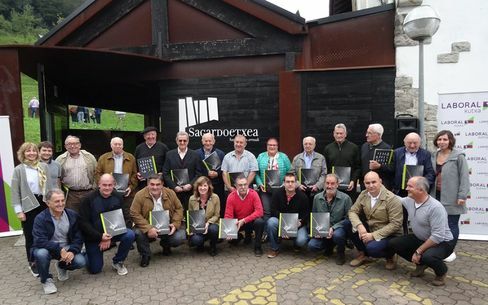 Juan Inaxio Astiazaran lasa, honored this year at Sagardo Eguna for all his dedication to the cider, is along with his wife and his two children, one of them is protagonists of the book. The aim of the authors of “Sagardogile” has been to make known the “world behind the production of the cider” so that the readers can see the evolution that cider houses have experienced in the last 40 years. Throughout the 10 pages dedicated to Iruin cider house in the book are collected testimonies and photographs of the entire Astiazaran family, where they explain how they priority the quality of the cider against the quantity, remenber that they were the pioneers in establishing the menú of cider house with a fixed Price and highlight the importance of making cider with three varities of apple to get the cider made by the Juan Inaxio´s grandfather, “with a lot of apple flavor”. 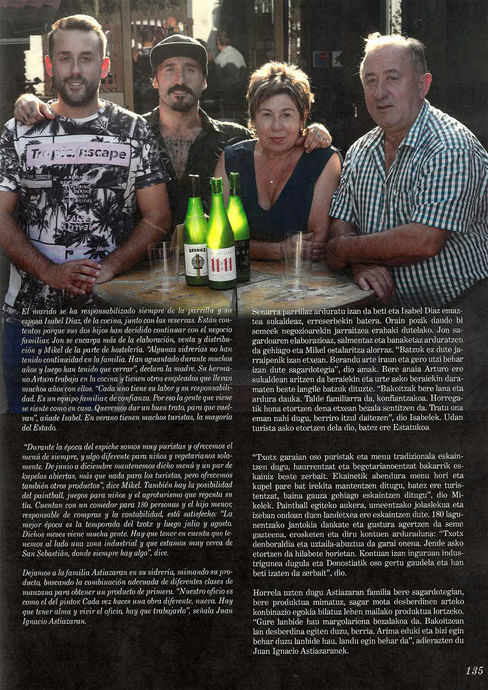 In “Sagardogile” is reflected the dedication that the Astiazaran family has int the family business and that currently managed by Ion and Mikel Astiazaran, the third generation of cider makers of this village located in the municipality of Usurbil.